If this were your last breath, would you feel comfortable dying? What happens when your body dies - is your soul transformed into energy? 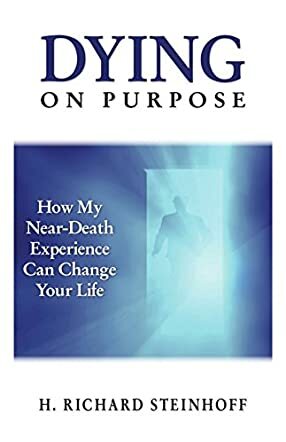 These are only two thought-provoking questions H. Richard Steinhoff asks us to consider in his book titled Dying On Purpose which documents his Near-Death Experience or NDE. The title leads to the mission of this book. We can either live “off-purpose,” which will always leave us unfulfilled and stressed, or “on-purpose” - doing the thing for which we were born. H. Richard Steinhoff, who has set goals since childhood, found his first goal easy to fulfill. A love of airplanes and space led to his work at NASA, serving in the Apollo program. Steinhoff participated in the lunar module and later the space shuttle programs. But by 1981, Steinhoff could see that the space program was winding down for the moment. Seeing the writing on the wall, he said goodbye to space and looked for his next opportunity. Steinhoff opened an office in the lucrative California Real Estate business. There was money to be made, but also stress; long hours, unhealthy eating and, worst of all, Steinhoff could see this was not where he should be. He also had misgivings about the ease of loans to people who could not afford the payments, and by 2008 his misgivings came true. The housing market crashed and so did Steinhoff’s health. He became very sick and tells us that he was afraid to pass out because he felt he might not wake up. A visit to the Emergency Room led to surgery needed to remove a diseased gall bladder. During surgery, Steinhoff experienced an extraordinary event that he was later to learn was a Near-Death Experience, which is exquisitely detailed in his book. During the NDE, he was told that he must return to his body as he had not completed his purpose on earth. During extensive scientific, spiritual and medical research, Steinhoff came across a theory that satisfied at least some of his questions. Steinhoff writes, “Then I opened a book about Albert Einstein’s theory on Energy and Matter: If Einstein is saying matter and energy are two different forms of the same thing; if that’s so, the experience I had with a supernatural being probably wasn’t in matter; it was in energy.” Dying on Purpose: How My Near-Death Experience Can Change Your Life is the result of Steinhoff’s purpose – his goal to teach us how to live a better life on-purpose. We are invited to come along and see what the possibilities are to live a happy, fulfilled life. Categories on preparing for your life purpose are included in the book with subjects including God, Family, Health, Business/Career, Finances, Dreams/Desires, or bucket list. This book is well laid out with epigraphs leading each chapter and life tips included in the epilogue. There is also an appendix listing suggested core values. Steinhoff has a web site listed in the book that readers can visit for additional free information.